Ordinary girl suddenly discovering a world filled of spirits or yokai and having her life altered forever is a common trope in shoujo manga, it is subgenre that can be relied upon for some interesting storytelling. However, is there room for more translated yokai titles after such great series such as Kamisama Kiss and Demon Prince of Momomochi House? Kijin is an ogre and the master of Tenjin-ya, an inn for ayakashi. 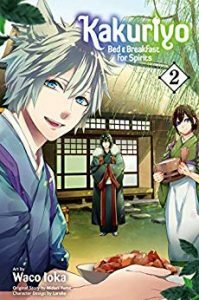 When Aoi refuses to become his fiancee, she offers to work at Tenjin-ya to pay off her grandfather’s debt, except none of the ayakashi in charge of the various functions of the inn are willing to hire a human. Aoi then meets Ginji, a nine-tailed fox with a series of different forms and he becomes her unofficial guide to the spirit world. As Aoi begins to become more aquainted with her strange new world, one constant that she takes with her is her joy in preparing food for people. I found the slice of life and food elements in this story entertaining. Where this title falls a little flat compared to similar series is the art. 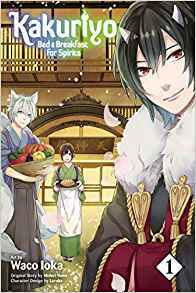 It works just fine, but without that something extra present that readers can find in the whimsy of Kamisama Kiss or the lush detail of The Demon Prince of Momochi House. I always hope that the opportunity to portray a spirit world will cause an artist to go wild with creativity and innovative character designs, but I wasn’t finding that in this series. I’m hoping though that the fact that the manga is an adaptation of a light novel series will mean that the plot will compensate for the art being less creative than I’d like for the subject matter. I did enjoy the setting in this first volume and I’m curious to see how the story unfolds.